In other creative changes, we have here the first in a rotating line of new scripters for the following six months, as Robert Bernstein takes on the duties for the next two issues. By 1963 Bernstein had been around for about fifteen years, writing for one comic publisher or another, though he never quite attained the accolades of a Stan Lee or a Gardner Fox. And he turns in a solid (if generally unremarkable) performance here: the voices sound in-character, the narration is informative without being distracting, and there are fewer than the usual number of credibility-busting clunkers we've come to expect from these stories. In fact, the only valid complaint isn't with the scripting at all. A few issues back I pointed out the seeming lack of confidence they had in the Torch's ability to draw an audience on his own, as his stories seemed to be heading more toward team-ups and guest stars. Nowhere is this more blatant, however, than the inexcusable bait-and-switch here. The Painter of a Thousand Perils is a fantastically Silver Age villain, and the image above of the Human Torch being attacked by his teammates is an exciting one. But while such a thing does in fact occur in the comic, it only happens on the second-to-last page of the story! If the tale weren't so darned enjoyable anyway, we just might be upset. "Look behind you! A three-headed monkey!" After signing off from his monthly duties on the Human Torch and Thor, we have here Larry Lieber's last regular story for Ant-Man as well. And, much as I dislike saying it, we won't really miss him. I do feel bad ragging on the guy, as his scripting abilities aren't terrible. But neither are they anything special, or what you would actually call good. Certainly he suffers unfairly in comparison to his brother Stan Lee, who has the ability to convey a complexity of character with just a few choice words. Larry, however, never seemed to pick up on this ability for nuance - the main innovation, it could be argued, which made the Marvel books different from everything else on the stands. But, surprisingly, he does at least leave us with a fairly clever twist. After Ant-Man is stricken with an aging ray that leaves him a frail, elderly man, he is then deposited in an empty flower pot: a simple prison out of which he could easily climb under normal circumstances, now unscalable due to his aged muscles. However, it's pointed out that no one actually realizes Ant-Man is a normal-sized man who can shrink down and then re-enlarge, rather than a superhero who is simply tiny all the time; as a result, he's able to simply use his enlarging gas to return himself to normal size and escape. It's a surprisingly inventive use of noticing the reader's natural assumption - that everyone else in the story knows what we know - and effectively subverting it. Most interesting about this issue, however, is the theme of ageism. Elias Weems is initially shown to be a pleasant, hard-working scientist, eagerly awaiting a visit from the grandson who looks up to him. He suffers a shock, though, when he is summarily fired from his job as part of the company's blanket disdain for elderly workers; they're now only interested in employing young, fresh minds. His response of declaring war on the world and aging everyone else to infirmity may be typically melodramatic, but the theme is still poignant, and makes for a somewhat more sympathetic villain than we're used to seeing. The last two decades have seen the society-wide idolization of youth surge forward to a frankly alarming degree, so - for the unusual prescience of mind, and deft handling of such an issue - it's nice to see Lieber go out on a high. Still trapped in Asgard after his capture by Thor last time, trickster god Loki still finds a way to sow his mischief here on Earth. 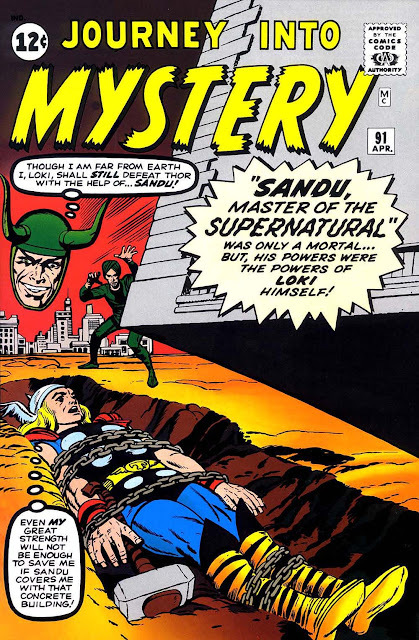 Detecting some small, latent abilities in Sandu, a carnival mentalist, Loki amplifies his powers from afar, giving Sandu the ability to read minds, levitate objects, and teleport himself and others. So, of course the shady character immediately turns to robbing his customers, stealing an entire city bank, setting himself up in a golden palace, and even abducting the United Nations building. But when he strains to lift Thor's mighty hammer, he short-circuits the power he's been given, and everything snaps back to normal. After last issue's turn by Al Hartley, this issue sees Joe Sinnott step in as penciller for (most of) the next six issues. A veritable industry legend, Sinnott is perhaps best known for his staggering 16-year stint inking The Fantastic Four, starting out on #44 (over Jack Kirby) and going through #231 (over Bill Sienkiewicz), with many other pencillers between. Though he was always in-demand as an inker, and highly sought after by the pencillers he worked with, his own pencilling work hasn't received nearly as much acclaim, and we can see why: His work is competent, professional, and absolutely solid - but, while there are no flaws to be found, there's also not much to set it apart from the other comic art appearing on the stands at that time. It's absolutely good, solid work, and should be appreciated for that, but it seems his real skill would be in embellishing the work of others, rather than in his own layouts and composition. Meet the Valkyries: Attendants to the Dead and Bringers of Belts! After last issue's disappointing turn, this comic is crammed SO full of ideas that you wonder why it isn't regarded as more of a classic than it is. (Probable answer: The Red Ghost and his Super-Apes.) For instance, for the first time since the first issue, we once again get a sense of the four as determined explorers, set on conquering new heights and discovering the unknown just because they can. Reed tells us of a meteorite from outer space that recently crashed in Siberia, has been harvested as a new source of fuel, and which suddenly makes space exploration possible again in a way it hadn't been before. In any other comic, this might have been the story, but here it's just one more intriguing detail in a lunar sea of ideas. However, this was during the height of the Space Race, so when the FF prepare a mission to the moon we shouldn't be surprised to see a parallel endeavour entered into by the Soviets. Strangely, scientist Ivan Kragoff is planning his launch not with fellow humans, but with three apes whom he has painstakingly trained: the gorilla has been taught to operate Ivan's space ship, the orangutan has become the ship's mechanic, and the baboon is now skilled with a gun. 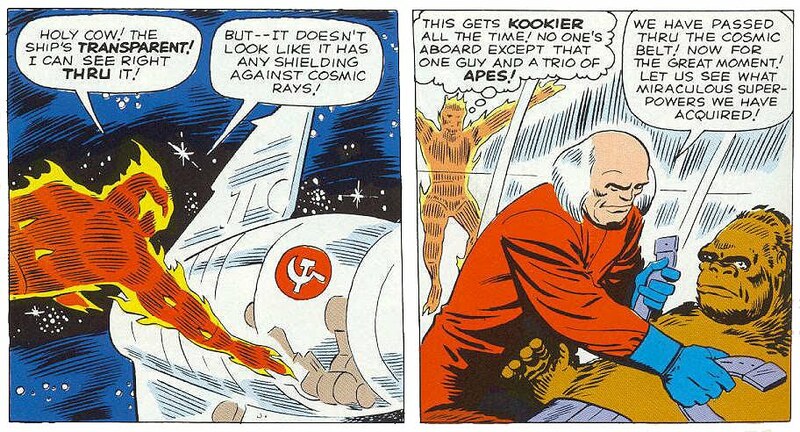 But while the FF has smartly shielded their rocket from the cosmic rays that gave them their powers back in FF #1, Ivan has made his craft transparent and with as little shielding as possible, in the hopes of duplicating the FF's accident! (This same trick would be performed by Hulk villains The U-Foes years later.) When this does in fact occur, Ivan finds he can now fade away like a ghost; the gorilla has become a super-strong powerhouse; the baboon can mold and change its shape at will; and the orangutan has become "magnetized" somehow. And if you're thinking that most of these approximate the powers of the FF, you'd be right. never even comes into it. One of the things that makes this issue such a gem is the sense of mystery and wonder that's conveyed in every page. When the FF rocketed into space in their very first issue in 1961, the original intent was a flight to the moon; however, this was changed in the finished comic to a vague trip "to the stars" because Stan feared that by the time the issue saw print, mankind might have already achieved such a thing, making the first issue immediately outdated. Think for a moment about what that means: that the advances in space exploration were so exciting to the public consciousness that new events seemed to spring forth with dizzying speed! But a year and a half later, we still hadn't reached the moon (and wouldn't for another six years after that), so Stan felt comfortable again with the idea. And why shouldn't he? It may seem blase to us now, but in a time of such unknowns, the idea of an extraterrestrial object - a new celestial landscape - being so close must have been fascinating! What could be found there? Who might live there? H.G. Wells' 1901 novel The First Men in the Moon found great success in these tantalizing questions, and it should be no surprise that a big-budget motion picture, adapted by Quatermass creator Nigel Kneale, would hit theaters just a year after this comic came out. but different enough to be unsettling and weird. 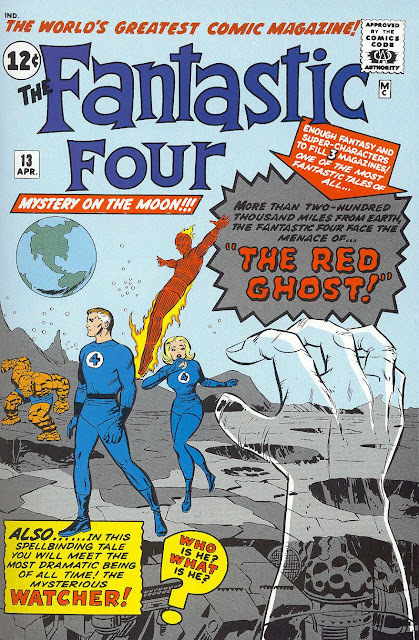 The Red Ghost and his Super-Apes may have (rightly) faded into obscurity, but an impressive number of other concepts were introduced in this issue that would later become important to the Marvel stories of the future. 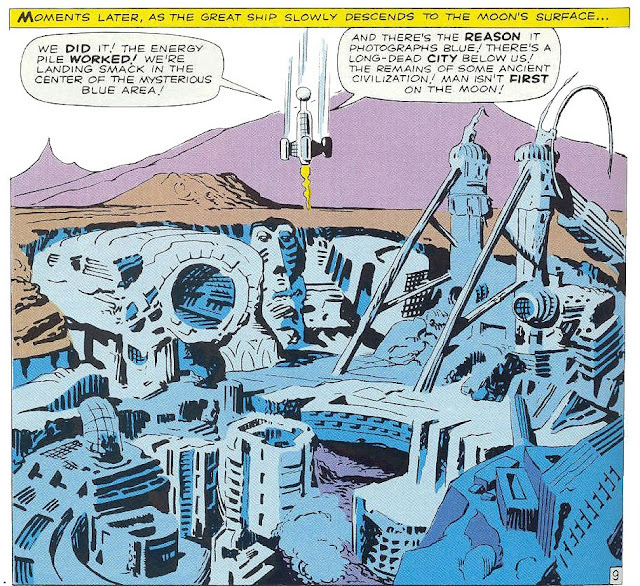 The Blue Area of the Moon, with an atmosphere all its own, is seen to house the remains of a long-dead civilization, and years later would become the new home of yet another exotic race. 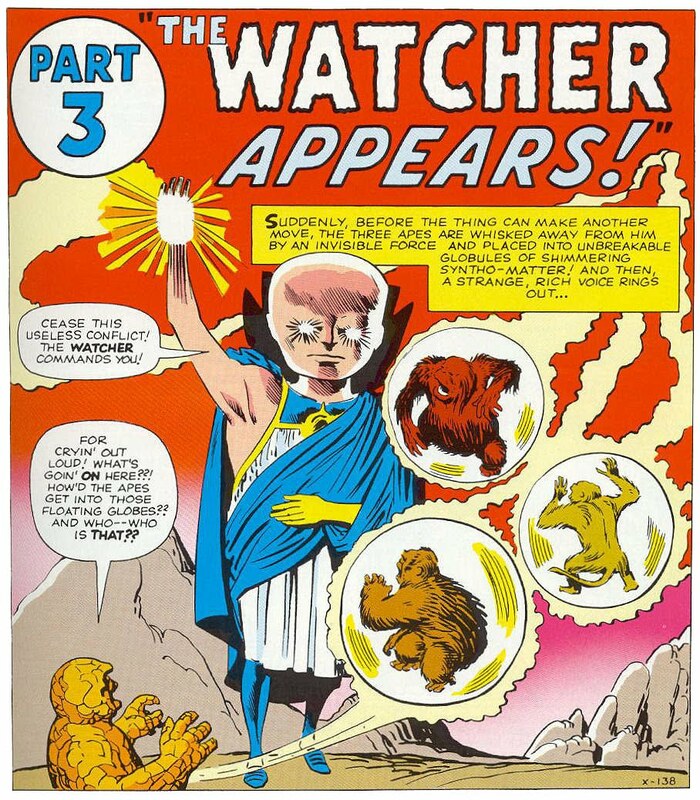 Most notably, however, the FF first meet The Watcher, member of an immeasurably long-lived race that has been witnessing and recording the myriad pockets of the universe for eons, sworn never to interfere. A reading limited only to a perspective of geek culture could see this as the progenitor of Star Trek's Prime Directive, but it's so much more than that. The members of the FF may have been to other worlds when abducted by this or that alien dictator, but it's notable that when we first see the four successfully exploring an uncharted world of their own volition, we also get an iconic, living reminder of the ideal of self-determination. It's pointing out to us that were we to encounter higher forms of life out in the heavens, we needn't take that as sign of our smallness or insignificance in the vastness of the cosmos; the time of Galileo's famed persecution for suggesting Earth was not the center of the universe is long past. After all, it's mankind's ambitions and accomplishments alone that would take us to such heights and beyond, and nothing should diminish that sense of self-actualization, regardless of who or what we were to find there. Standing on the cusp of space exploration, these were undoubtedly fears deeply rooted in the public's minds, whether they were aware of them or not, and it's astonishing how well - and how subtly - Stan was able to address them, and turn such fears into hope and inspiration. that there was another "Voice of Doom" on the stands that selfsame week...? At a faroff glance, it always seemed odd that Jack Kirby drew the first five issues of The Incredible Hulk, but Steve Ditko drew the sixth. 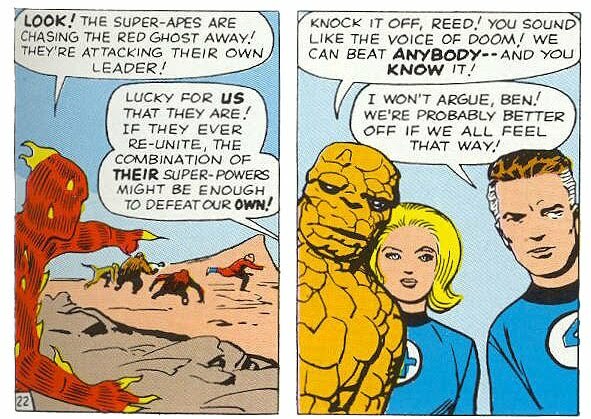 Now, having seen Kirby's disappearance over the past month from all of his titles but The Fantastic Four, it at least has some context to it - if still no answer to the mystery. Of course, it's entirely possible to imagine Jack getting the absurd plot for this issue and exclaiming, "Are you outta yer mind, Stan?! I ain't drawin' that!" But, surprisingly, Kirby's loss is Ditko's gain (and ours, as well), as Steve turns out to be the perfect choice for illustrating something just this WEIRD, as well as infusing the characters with the sense of paranoia and desperation so often found in his figures. 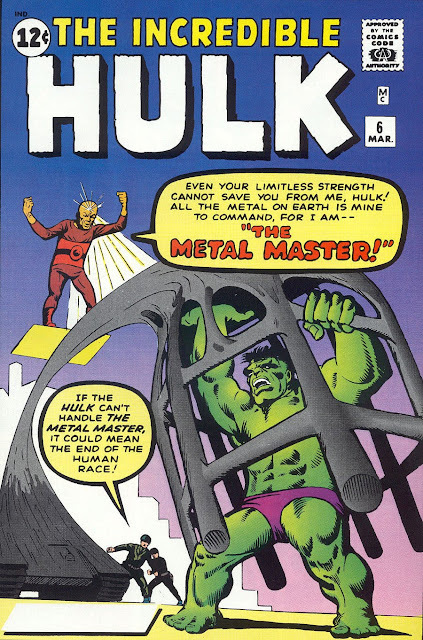 Okay, yes, the weirdness: Over the course of the series to date, Stan has turned the Hulk from a creature who only emerges at night, to a dumb brute telepathically controlled by Rick Jones, to an intelligent and cruel monster he can turn on and off with the use of a gamma ray machine. This time, though, something goes wrong - and he emerges as a bizarre hybrid, with Banner's head on the Hulk's body. 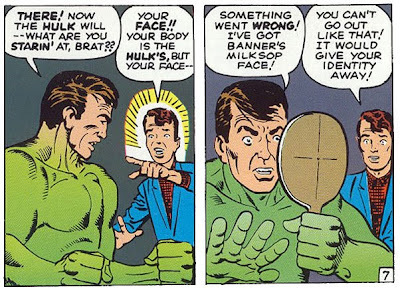 When Rick worries that this would endanger the Hulk's secret identity, the Hulk goes and picks up a lifelike Hulk mask - one of several copies he'd had made, for study (??) - and slaps it on. Unfortunately, when a group of army goons apprehend an unconscious Hulk, they immediately pull off his Hulk mask ... only to discover a Hulk head underneath, having finally caught up to the rest of him. Which, while insane, really makes you wonder: Just what on earth was such a ludicrous development for?! Bob Haney's Teen Titans, over at DC. And you should! Meanwhile, in the category of "too little, too late", Stan finally gets around to fleshing out Rick Jones a little as he purports to give him something of a supporting cast. Despite having been dared by his friends onto the bomb test site in issue #1, we've only seen Rick as something of a loner ever since. Here he meets up with them once again - though none of them are actually named - and they decide to form a kid-gang called (at least by themselves) The Teen Brigade. Surprisingly, they would actually go on to appear a handful of times in the next couple of years! Unsurprisingly, they never caught on. Though Ditko inking Kirby in #2 was a mismatch, he's great on his own. The emotive expressions and exaggerated body language are truly inspired.